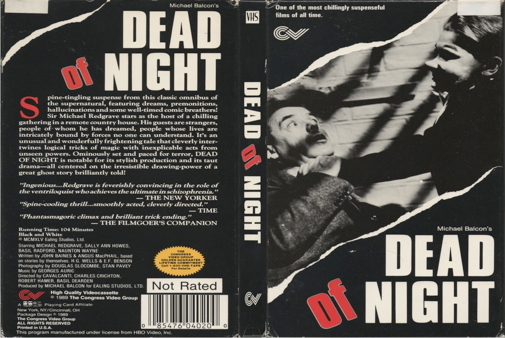 Considered the greatest horror anthology film, the classic British chiller Dead of Night features five stories of supernatural terror from four different directors, yet it ultimately feels like a unified whole. The framing device is simple but unsettling, as a group of strangers find themselves inexplicably gathered at an isolated country estate, uncertain why they have come. The topic of conversation soon turns to the world of dreams and nightmares, and each guest shares a frightening event from his/her own past. Many of these tales have become famous, including Basil Dearden's opening vignette about a ghostly driver with "room for one more" in the back of his hearse. Equally eerie are Robert Hamer's look at a haunted antique mirror that gradually begins to possess its owner's soul, and Alberto Cavalcanti's ghost story about a mysterious young girl during a Christmas party. Legendary Ealing comedy director Charles Crichton lightens the mood with an amusing interlude about the spirit of a deceased golfer haunting his former partner, leaving viewers vulnerable to Cavalcanti's superb and much-imitated closing segment, about a ventriloquist (Michael Redgrave) slowly driven mad when his dummy appears to come to life.